Every single people require a stylish and healthy kitchen and to maintain it perfectly, a kitchen has to be free from all sorts of odors, fumes, grease, steam, and gases. So, if you want to achieve this kind of ideal kitchen for your home, then you should install a top-class modular or electric kitchen chimney. These types of chimneys are often called as cooker hood. If you need a well- decorated kitchen, then a kitchen chimney is the best option. It will make your cooking experience convenient, easy, and incredible one. It can help to eliminate harmful dirt and smoke. A modular kitchen chimney is a perfect choice for reshuffling a kitchen. If you are tired of your kitchen’s unbearable aroma, then it could be the reason for insufficient ventilation in your kitchen. You can definitely choose Hindware 1200 m3/Hr Cleo 60 cm Auto Clean Hood that has come with great effectiveness and futuristic design. This particular hood makes sure that the smoke and fumes from your cooktop don’t spread across the other parts of your house. Style and Size: It is basically a stainless steel and wall-mounted hood that is featured with black toughened glass. It is associated with the size and dimensions of 600mm and (600x500x520) mm respectively. It is also featured with the energy efficient and incredible LED lamps. 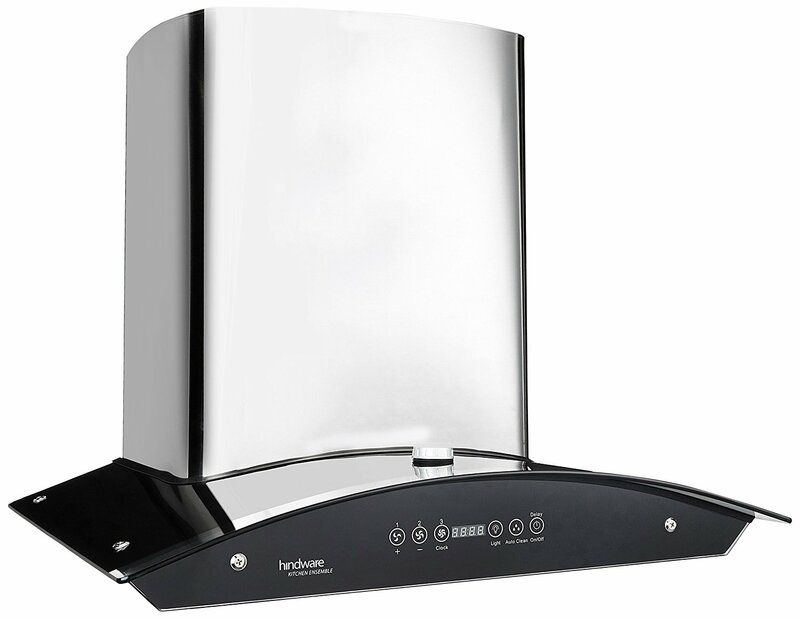 Brush silver finish or Inox color: This Auto Clean Hood has come with a brush silver as well as Inox color scheme. These elegant colors will enhance the looks and feel of your modular kitchens. 3 speed touch control: It is associated with efficient functionality and futuristic design as well as it is providing a complete control over the three speed levels. These 3 speeds can be regulated through a touch-sensitive interface. Capacity: It is featured with the airflow capacity of 1200 m3/hr and also involved with the feature of water auto-clean along with oil collector cup. An impressive metallic blower and SS Baffle Filter are also installed in it. It is featured with 3 Speed Soft Touch Control for your convenience. Energy Requirement: This specific kitchen hood requires the voltage of 220-240V/50Hz and 58 dB(A) is its associated noise level. Price, Warranty, and Package: It comes with a budget-friendly and affordable price of ₹22,990.00. The specific kitchen hood is featured with the warranty of 1 year (Comprehensive) as well as 5 Years (on Motor). The product package is associated with 1 Cooker hood, 1 Remote, 1 User Manual, and the Fixture materials. The hindware 1200 m3/hr cleo 60 cm is an incredible and auto clean kitchen chimney that can be the best solution for your dream kitchen. It is featured with an incredible design and it also provides an effective solution of cooking fumes and smoke.